A piece of unexpected good news has arrived at Downie Towers – Ruso and Tilla’s first adventure is being translated into Croatian. 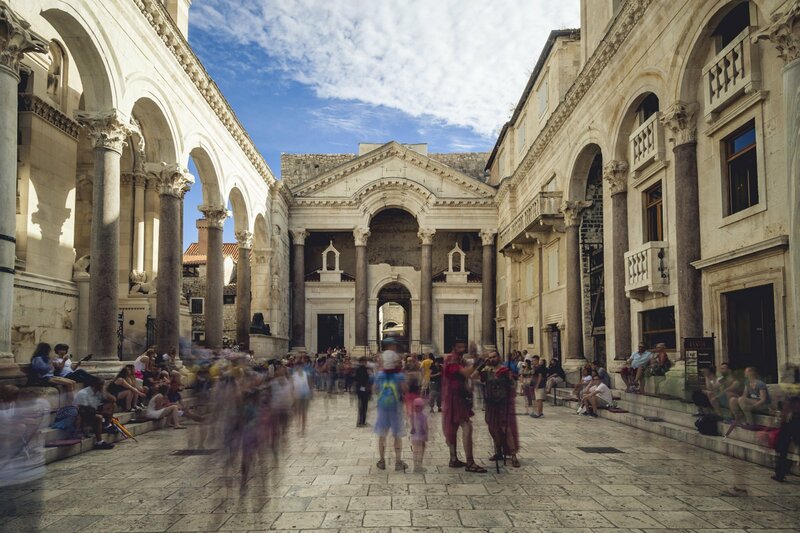 To celebrate, here’s a view of Croatia’s most famous Roman building, the palace of the emperor Diocletian at Split. Diocletian was an unusual emperor. Others had commissioned sprawling extravganzas with vistas and lakes for their personal residences, but Diocletian’s architect must have been told to think very much INSIDE the box. The whole palace fitted into the standard walled rectangle of a Roman fort. Meanwhile, Diocletian was a man on a mission. He’s chiefly famous not for waging war (although he did) but for his less glamorous attempts to rescue the struggling Empire from chaos by sharing power, re-ordering local government, and trying to crack down on raging inflation and profiteering. His Edict setting maximum prices for goods across the Empire was inspired by his observation that “Greed raves and burns and sets no limits on itself,” and who could argue with that? You can read the full text of the introduction here, and there’s a video featuring one of the remaining copies of the Edict here. He also seems to have been a man with a plan. In his sixties and in failing health, he handed over power to his pre-arranged successor, moved back to his native land and – as far as we know – enjoyed a relatively peaceful retirement. Which made him a very unusual Emperor indeed. Trying to limit prices by government edict is folly; perhaps Diocletian wasn’t to know that at the time, but Wikipedia notes that “the Edict on Maximum Prices (301), his attempt to curb inflation via price controls, was counterproductive and quickly ignored.” He seems to have been a fan of Big Government in general, who increased government spending and taxes, and also made a big and unsuccessful attempt to wipe out Christianity. Could be an interesting alternative-history scenario: if he’d succeeded in wiping out Christianity then, it might never have recovered. What would have happened to Judaism? Would Islam, or something like it, ever have got started? It’s interesting to speculate, isn’t it? I think he made a bold attempt to halt the slide into chaos. While it’s apparent with hindsight that fixing prices wasn’t likely to work (although it’s been awfully useful for researchers and novelists ever since) I suspect Diocletian in his turn would have been amazed by our contemporary “experts” who thought that lending money to people who patently couldn’t pay it back – and then selling the debt to somebody else – was a cunning plan. Although given his observations on greed, maybe not. If he had succeeded in wiping out Christianity, I wonder what religion we’d have now? Sadly we know so little about the beliefs of ancient Britannia that it’s hard to know exactly what the Church replaced.